In a recent podcast with our associates Investor’s Champion, Chris Boxall of Fundamental Asset Management discussed some of the problems with company reporting, notably with reference to UK banks, and and why clear, easy-to-read financial statements, with a minimum of adjustments, can be good for your investment portfolio. In this regard, full year results from AIM quoted Quartix (AIM:QTX) yet again set the benchmark for other AIM companies to follow. The first thing one notices with the results announcement from Quartix is that these represent final ‘audited’ numbers and not the usual ‘preliminary’ accounts many listed companies tend to issue. With a financial year end of 31 December 2018, it’s highly commendable that Quartix can issue these prior to the end of February. Founded in 2001, Quartix is a leading supplier of subscription-based vehicle tracking systems, software and services. The Group provides an integrated tracking and telematics data analysis solution for fleets of commercial vehicles and “pay as you drive” motor insurance providers that is designed to improve productivity and lower costs by capturing, analysing and reporting vehicle and driver data. Quartix is based in the UK but growing strongly in overseas markets, particularly in France and the United States. While the financial highlights do mention ‘adjusted EBITDA’ the results are mercifully free of too many references to adjusted numbers and thankfully there is no mention of the dreaded ‘underlying’ anywhere. This is in stark contrast to the banks discussed in the podcast, who clearly have plenty of adjustments to make excuses for! Operating margins of 31% and a return on equity touching 40%, reflected in excellent cash flow, highlights the quality of this small business. While a single customer dominates its insurance related activities, this part of the business is in planned decline as it focuses on growing its fleet operations, where no single customer dominates. Our associates Investor’s Champion also interviewed Quartix founder and Chief Executive Andy Walters in a podcast here; it’s worth listening to. A manufacturer of advanced testing systems to the global automotive industry has just delivered yet another set of fabulous results. While many seem intent on criticising AIM for its looser regulation (and ‘occasional’ problem case) this little business has delivered consistent excellence since arriving on AIM in 2013, with little fanfare I should add. It also highlights the potential to uncover some really brilliant businesses on the junior market if one undertakes proper research and displays a bit of patience. Our latest Blog covers this delightful Group’s journey from AIM Admission which serves as an excellent guide of what to look out for in the search for high performing micro-caps. With its headquarters in the delightful town of Bradford-on-Avon, Wiltshire, AB Dynamics (AIM:ABDP) is engaged in the design, manufacture and supply to the global automotive industry of advanced testing and measurement products for vehicle suspension, brakes and steering both in the laboratory and on the test track. Customers include the research and development divisions of some of the world’s leading vehicle manufacturers, including Ford, Toyota, Daimler, BMW, Volkswagen and Honda. At a time when the automotive industry is under intense scrutiny following the VW (and more recently Mitsubishi) emissions scandal, AB Dynamics excellent engineering offering is in increasing demand. Operating subsidiary Anthony Best Dynamics Limited, was founded in 1982 by current Executive Chairman Anthony Best as a design consultancy in mechanical vibration and vehicle suspension to the automotive and wider engineering industry. In 1983, Andrew Middleton joined the Group and added expertise in noise consultancy to the Group’s service offering. In the 1980s and 1990s, the Group was involved in a number of consultancy projects, including the design of the suspension of the McLaren F1 road car, an active suspension system for Jaguar and the development for Land Rover of a measurement and analytical system for end-of-line noise vibration and harshness called PLATO. 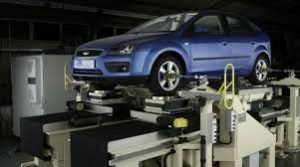 In the 1990s, as the UK automotive industry continued to decline, the Group shifted its focus away from consultancy towards the design and production of vehicle test equipment for automotive manufacturers and suppliers. This led to the design and manufacture of the Suspension Parameter Measurement Machine (SPMM), one of the Group’s key products. The SPMM measures the kinematic and compliance characteristics of vehicles by employing a method of moving the vehicle’s body in a manner that simulates the real motion of a vehicle on the road. This method also allows accurate measurements to be made of a vehicle’s inertial properties and centre of gravity. Over the years the range of vehicle testing products was expanded to meet the growing demands of the industry. 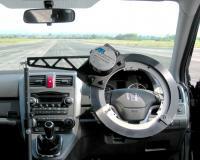 In 1998 it supplied its first steering robot for quantitative vehicle testing on the track and has, to date, supplied over 300 driving robot systems around the world. The Group was also a pioneer in using inertial GPS motion packs to control the path of a vehicle in 2003 and, in 2007, was one of the first manufacturers to sell a driverless system for testing vehicles on the track. With founder and Executive Chairman Tony Best seeking to enhance the Group’s corporate profile and provide for some succession planning a listing on AIM was the preferred option. Despite his advanced years Tony remain very active in the business. Tim Rogers joined the Group as Chief Executive in October 2012 in preparation for their launch onto public markets. Prior to joining ABDP Tim was CEO and Executive VP of Clean Diesel Technologies, Inc which specialised in vehicle emission reduction technology. The Group arrived on AIM on 22nd May 2013 with a market capitalisation of a mere £14m having raised gross proceeds of only £2m (net) and with a flawless balance sheet. The founders and senior management also sold down a combined £2.5m on listing to offer a degree of liquidity. The market capitalisation has since grown to £84m, solely organically! For the full year ending 31st August 2012 prior to arrival on AIM the Group reported revenue of £8.9m and pre-tax profit of £1.9m. Their most recent ‘half year’ results are now exceeding those numbers. Not long after arrival on AIM came news of two significant contract wins and then a month or so later yet another significant contract win. By the time of the announcement of its maiden AIM results on 7th November 2013 covering the year to 31st August 2013 the share price had already more than doubled to 170p. This was supported by full year results which saw revenue up 37% to £12.2m and operating profit up 22% to £2.2m. Cash had also risen to £6.0m. The only frustration during this time was uncertainty surrounding a new purpose built factory that they were hoping to build. The good news continued throughout 2014 including a significant contract win for their Suspension Parameter Measurement Machine (“SPMM”) from China. Having reassured on 10th September 2014 that results for the year ended 31 August 2014 were likely to be in line with market forecasts, by the end of that month they were saying that profits for the year were now likely to exceed market forecasts due to higher than anticipated profit on a number of contracts. There is nothing like under promising and over delivering! The most recent full year results for year ending August 2015 saw revenue leap again by 19% to £16.52m and operating profit up a whopping 41% to £3.74m. Net cash at year end stood at an impressive £7.97m. This week they announced tremendous interim results for the 6 months ending 29th February 2016 with profit before tax up 50% to £2.26m on revenues up 34% to 10.11m. In summary, up to now this business has delivered all that could be asked of it. More importantly it displays everything one would want from a small high growth business on AIM. Senior management receive reasonable salaries, commensurate with the size of the business, and more importantly, have plenty of ‘skin in the game’, via direct equity holdings and some encouraging options; they are therefore well aligned with shareholders. Since listing, principal shareholder Anthony Best has taken the opportunity to dispose of further shares, supporting better liquidity, though still retains a material 37.5% stake in the business. The group is growing the top line at a terrific rate, supported by internally generated cash and without the need to return to the market for further funding. Growth up to now has also been all organic. Operating margins are a very healthy 22%, cash flow highly positive and a return on equity of 23% is just what one should be looking for. Newsflow has been regular, if not overwhelming, resulting in regular earnings upgrades. The Group is debt free and the cash pile has grown to just over £10m. In isolation this looks excessive for a small business of its size, but that will soon be put to good use in supporting the development of the new facility. It’s worth also noting how, ever since listing, ABDP has reported its results in a timely fashion. Full year results for the year to August 2015 were announced on 12th November and the most recent interims to 29th February 2016 were announced on 26th April 2016. We are always surprised why other AIM companies can’t deliver in this timescale. The Group continues to enjoy strong demand for its products and services, with both its established and newly developed range of products driving growth in revenues. Key markets in China, Europe, Korea and Japan remain strong and they see continued spend on R&D by the global automotive industry, notably in the areas of active safety systems and improved vehicle dynamics, where the Group’s products are particularly suited. Two additional manufacturing units came on line this year more than doubling total floor area to 23,551 ft². The Company also confirmed they were making good progress in the design and build of the new facility which is targeted for completion during 2017 which will bring UK operations together again under one roof and create the necessary headroom for future growth. A collaboration agreement with Williams Advanced Engineering is currently for a novel Driver in Loop Simulator which will help their car customers develop safer and better cars by combining the driver with computational car modelling. In response to the latest results the house broker lifted estimates for the financial year ending August 2016 to sales of £20.2m, pre-tax profit of £4.7m and earnings per share of 21.6p. At the current share price of 485p this puts the shares on a fairly punchy current year rating of 22x, although stripping out the cash pile brings that down to a more manageable 19x. Earnings are anticipated to grow to 24.6p in 2017 (PER 19.7x) and as they start to reap the benefits of the new facility, forecast to jump to 32p for the year ending August 2018. There are bound to be a few speed bumps on the road to further success, which may rock the share price, but AB Dynamics has performed admirably up to now. The move to a larger facility in 2017, increased sales in Europe and Asia and the recent strategic alliance with Williams suggests a very exciting future for this specialist engineer. ​The surgical and advanced woundcare company and one of AIM’s star performers has announced that the FDA has approved two new product claims for the Group’s product. The news moved the shares up another leg to new highs. The FDA has approved two new product claims for the Group’s octyl formulation product, LiquiBand Exceed™ giving it a competitive advantage in the topical skin adhesive market. The two new claims include the use of a single device to cover wounds of up to 30cm, as well as a single device being suitable for intraoperative reuse for up to 90 minutes on a single patient. Both claims are unique FDA approved claims for the US Topical Skin Adhesive Market. Following testing, LiquiBand® Exceed™ was found to deliver best in class yield to support coverage up to 30cm of wound length, twice the amount advertised by market leading topical skin adhesive products. This is yet another example a high quality AIM stock that is continuing to deliver highly positive news. The valuation looks rich but this business addresses a huge market and has delivered handsomely over the past few years.